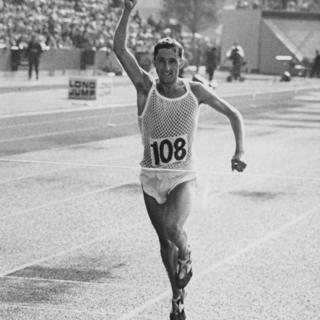 The 78-year-old won marathon gold medals at the European Championships in 1969 and the 1970 Commonwealth Games. He said he felt a pain in his chest while out running. "After 400m my heart started to hurt and by the time I got to the one mile (1.6km) point I thought I was going to die," he added. "I was in such pain and I thought 'no, hang on, this isn't going anywhere at the moment', and really in respect of my wife, two sons and friends I need to stop this." The Facebook page for his clothing brand said he "decided to take a day off" due to illness. Paying tribute to his achievements on the social media page, David Hope said: "An amazing achievement and an amazing and lovely fella. Well done, Ron." Julie O'Brien wrote: "We're wishing you a speedy recovery Ron, you're a total legend and inspire many many people." Born in Accrington, Dr Ron Hill MBE was the first Briton to win the Boston Marathon in 1970. In the same year, he claimed a marathon time of two hours nine minutes 28 seconds in the Commonwealth Games in Edinburgh. Off the track he established Ron Hill Sports, pioneering use of synthetic fabrics in sportswear, and was given the Freedom of Accrington in 2012. A street in the town - Ron Hill Way - was named after him two years later.